Season 3 of Star Wars Rebels has been a notably darker season than its previous two. In its premiere, Rebels dealt heavily with Ezra's anger and his pull to the dark side, while the following episodes centering on Sabine and Hera touched on the hardships in their pasts that led them to join the Rebellion. Even Chopper may have a sad and tragic backstory, as implied by the mourning the droid exhibited in last week's episode. This week, Star Wars Rebels continues looking to the past in 'The Last Battle' - written by Brent Friedman and directed by Bosco Ng - when a salvage mission led by Captain Rex stumbles upon a still active unit of battle droids. Led by a Super Tactical Droid who refused to follow shut down orders at the end of the Clone Wars, believing them to be a Republic trick, the droids intend to fight one last battle against the Republic - represented by Rex, Kanan, and Ezra - to determine who is the final victor of the Clone Wars. Star Wars Rebels was preceded by Star Wars: The Clone Wars, a Cartoon Network series that aired from 2008 to 2015 and bridged the gap between Episodes II and III. That series was forced to end when Disney bought Lucasfilm, but many of its creators were moved to a second project, Star Wars Rebels. It would both be its own series (and strictly Disney's) but still be very much a continuation of the work done on The Clone Wars. 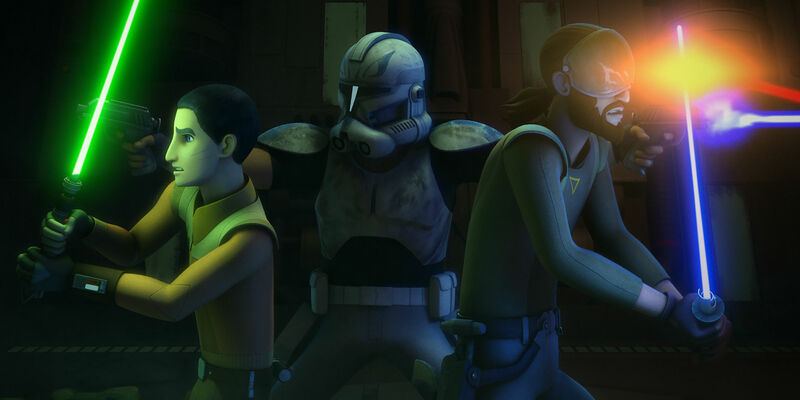 Rebels had a fresh start and it wasn't necessary to have seen The Clone Wars to follow along, but as the series continued, more of Clone Wars began resurfacing. Most obviously there was the return of Ahsoka, a main character from The Clone Wars series, but also the return of Captain Rex and the few other surviving Clone Troopers. 'The Last Battle' was all about Rex and the lingering effects the Clone Wars has on his life. First and foremost, though the war is over, Rex's clone programming still makes him a soldier. But he's a damn good one, with training and an understanding of battle tactics that stormtroopers could only dream of having. (Side note: How funny was it having battle droids meet stormtroopers?) This episode was a catharsis for Rex, allowing him to find closure and move on. In a strange way, this episode was closure for the Clone Wars, too, finally bringing a decades-old conflict to an end. As a final nod to Star Wars: The Clone Wars, this episode's Star Wars Rebels title card was rendered in The Clone Wars style, and the credits music was also from that earlier series. They're little touches, but ones that only strengthen the bond between these two series. Who Actually Won The Clone Wars? Besides just tugging on the heartstrings of Clone Wars fans, 'The Last Battle' finally addresses some truths about who the real enemy is and where they came from. The Clone Wars was waged between the Galactic Republic and the Separatist Alliance, but neither of those things even exist anymore. It's Ezra, being the one farthest removed from the Clones Wars, who makes the observation, remarking to Rex and the Tactical Droid that, "If none of you won, who did?" Of course, we the viewers understand what machinations were going on behind the scenes. We understand that the Galactic Empire rose from the ashes of the Republic because the whole war was a master plan by Palpatine (now known to his friends as, The Emperor). But it's interesting to think about how the characters understand it. To them, the Republic just morphed into an even bigger enemy after the Separatist Alliance dissolved - something that, again, we know happened because the remaining Separatists leaders were killed by Darth Vader on Mustafar. So to the average citizen living in a galaxy far, far away, who did win the Clone Wars? And even for the Ghost crew, who do they think won the Clone Wars? It may seem worthless to wonder about this while there are much bigger threats, like The Empire. But considering that we, the audience, know it was the Sith behind it all, it's an important question for the Rebels - and especially Ezra - to be asking. After season 3 began so heavily, it's refreshing to have an episode which feels, at least in moments, to be more light-hearted. There's always fun to had when the battle droids are around, but it was also a little sad once they were gone. That may just be the way it is going forward on Star Wars Rebels, all of the fun will be tinged with a little sadness because we know things are going to get a lot worse before they can get any better. Star Wars Rebels season 3 continues Saturday, November 5th at 8:30PM on Disney XD.